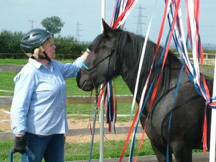 Lotta is an affiliated and fully insured Horse Agility Accredited Trainer (HAAT) and Judge and runs training days and competitions throughout the South West of England. Horse Agility offers horse lovers, enthusiasts and professionals the opportunity to take their horses out and about without the high levels of stress and tension other shows and competitions usually involve. You don’t even need to scrape the mud off your horse to come to Horse Agility and all you need is a head collar and a long lead rope – no tack, gadgets, sticks or coercion. My training days focus on using basic levels of learning theory and introducing the principles of positive reinforcement training. I aim to help handlers take the pressure off the horses and develop more positive ways to train and learn safely. This is not only more motivating and rewarding for the horses, but also easier for handlers to apply consistently. 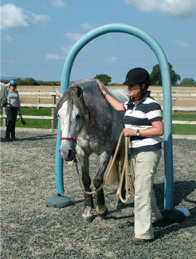 Horse Agility was started as a club by Vanessa Bee in 2003 after watching handlers and dogs having fun with dog agility. Vanessa has always worked and trained her horses at liberty and with obstacles and after watching dog trainers do this with their canines she decided to start offering training for this fun sport with horses. Since then the club has grown into an International Club with over 500 members in UK and many more in 28 countries throughout the world. 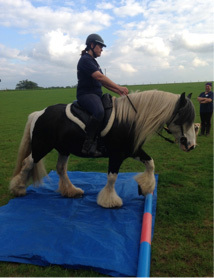 The principles of Horse Agility are to help horse and handler learn to go through, over and under obstacles calmly and safely whilst having fun. Brand new for 2016!! HORSE ABILITY!! This is a brand new concept I have started with like minded classically trained riding instructors where we include a ridden classical equitation element to the day. 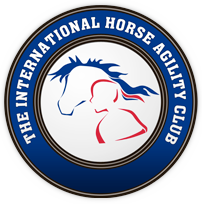 Horse Ability will have all the benefits of the Horse Agility training days as well as in hand and ridden foundation lateral work in a fun and engaging way. The morning will be spent negotiating the obstacles in hand but with increased focus on lateral exercises. The aim is to work on the biomechanical and athletic development of the horse which we can then transfer this to the saddle in the afternoon. Please see the events page for all forthcoming events and clinics.